It's the end of week 4 already here in New Zealand. Actually it was the end of the week last night for most people - it is Waitangi Day, our National Holiday, so no one (well hardly anyone) is at work. One more week to go. I wonder what Maki has in store for us - and I wonder how many of us will keep going after the end of week 5. I know I intend to. How did everyone get on with making bentos for picky men and kids this week? And how is the weight loss going? I started the week with a depressing visit to the scales. I didn't lose any weight! But I didn't put any on either, so I gritted my teeth and continued with the low calorie bentos. Hopefully this week will be better. There are so many things that affect your weight - your menstrual cycle, hot weather, etc, and it's easy to get discouraged when you've been really good but still don't lose weight. On Monday I had a 345 kcal lunch of my version of Maki's dry vegetarian curry, with quinoa (for protein), curried shrimps, feta, tomatoes, and zucchini and mushroom stir fry. On Tuesday I had a Thai steamed curry, more shrimps, more zucchini & mushroom, some barley tabbouleh, tomatoes, and the first runner beans from the garden this year: 346 kcal. On Thursday I took my lunch to the Botanic Gardens to eat. It was a glorious day. I had another steamed curry, more dry curry and quinoa, tomatoes, feta, a gherkin (just one left in the jar now), and some experimental stuff I made out of dried tofu, carrots and cabbage. I made it like Maki's kinpira. Does kinpira have to be only vegetables? It turned out nice anyway. The lunch was 448 kcal. And today I munched stuff out of the fridge. But I also had some nectarines from my little tiny potted tree. Isn't it cute? OMG I love your little tree!! Seconded! It's an adorable looking tree. Whut?? Where did the week go??? Argh!!! Here is my week of bento-ing ! My goals : go deeper level again, with a special attention towards non-meat bentos. However I knew I couldn't do much about this week's goals, since I live away from my family, have no boyfriend, and don't know my new classmates of the semester yet. I proposed to make a bento for a friend who usually eat some sandwiches when we eat together though. This is actually a dinner bento ; I needed something pretty nutritious since I was up in the streets pretty late that night (now that sounds weird. Precision : it was for an alley cat ! ), hence the cream scones. Hum, they're actually hidden on this photo, but you can see how big they are on another photo in my stream. It reminds me I also had some savoury scones in previous bentos - I should make them more often ! This is the bento I made for my friend. She actually asked for a repeat of Monday's bento which I ate when I was with her, so it wasn't that hard to put it together. Plus, it used up the last bagel ! I just changed a few things : the filling of the bagel ( hers was sheep's milk cheese and sweet pepper and onion confit. She has a sweet tooth, so I thought it would suit her better than cream cheese and walnuts), and I added vegan turnip cakes for more proteins. I didn't need a bento myself this day. It's also the only one of the week with white rice. The turnip cakes were a hit ! Altogether not a bad week, but a bit lacking in terms of vegetables I think. My friend enjoyed her bento, and she liked the bagel sandwich even though it was a first for her - and I encouraged her to make a bento for herself to try it next time ! I want to go back to more traditional bento maybe, and do only 1 (max 2) sandwich bento... I'm becoming too accustomed to those. One more week to go ! Like Bronwyn, I think I'll make bento on a more regular basis, and much more efficiently I hope. Whew! It's been a long week. Out of all of the themes for this challenge so far, I have definitely embraced this one wholeheartedly. To explain (I also have been talking about this on my blog recently): I have a coworker who has been in the habit of sampling food from my lunch from time to time (I offer it to her - she's not rude about it! ;) ). A couple of weeks ago, after trying something, she exclaimed, "Hey, I would pay you to cook for me!" and I didn't take her quite seriously but, after a few more conversations, we worked out a deal, and so this week I made her first bento lunch on Thursday, for which she paid me. I will be making her up to three lunches a week, on Tuesdays, Wednesdays, and Thursdays, from now on. And, in addition, word has gotten around the school where I work and now I have an estimated half dozen (at least) other coworkers who are interested in becoming my customers! Upon reflection, I realized that there are quite a few teachers and administrators whom I see regularly heating up frozen meals, making those "Simply Asian" or whatever instant noodle things where you just add hot water, or getting takeout. 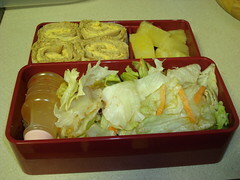 My bento lunches could be a healthier and relatively economical alternative for those people. Overall, I'm thrilled to be given this opportunity, but I'm also pretty worried that I could get easily stressed out, so I'm hoping to take some time this weekend to plan out how I would offer my bento making services and what limits I would place on it. I'm definitely going to be utilizing more resources on Just Bento if I embark on this - definitely appreciating all your hard work, Maki! And everyone else who is participating in the challenge - very inspiring. My week wrapup is here. Working on writing up Week 5 outline - the last week! Where did the time go? Here's my report for Week 4 (with stupid thumbnails AGAIN. I need to find a better site to upload my photos to). This weeks challenge is declared a resounding success. The Boy is eating his bentos and has even lost a bit of gut this week (our scales are broken so I have no idea if it's in our heads or we've actually lost weight). He's interested in the process, watches me make it and has requested things including declaring that a bento isn't the same without a hard boiled egg. Hence many many eggs in the bentos lately. Other than that success, I don't feel like I branched out as a bentoer this week. I feel in a food rut and also ate like crap other than my bentos *blush* but today is a new day and I'm declaring myself back on the not-eating-like-crap wagon again. We also got the keys to our new house yesterday! Very exciting. Our hallway is getting full of boxes and we have about a month to move about 6 blocks, so less stress than my usual moves. But it's also sad because there probably won't be much oppurtunity to get more interesting with the bentos until we're settled. Hopefully in the back of the pantry I find some inspiration I have to use up. * sort bento boxes into what I really want to keep & what I am willing to give away - DONE! 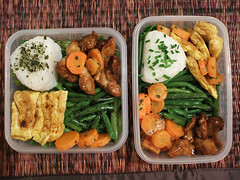 * identify bento boxes that suit caloric intake per meal - DONE!! we will start fresh in week 5! * refine mise en place according to meal plans - ONGOING! * post here and write a report on my adventures! - DONE!! 3 were made but no photos to post because the cameras died and I can't get the ones on the cell phone OFF of the damn phone to post them! If I ever get them off the damn phone I will add them here. Last week was good, and bad. The good was that most days, I packed food that was stomach-friendly. I ate out only once, which was also good. Also a bit of pre-planning, which helped for the first three days. I didn't end up packing a lunch for my mother as she came home from down south before I could surprise her, though I did end up feeding a few riceballs to my boyfriend, which was a success. He eats practically anything anyway, so I don't think that was really...a challenge. I'm more concerned about sending wrong signals and interfering with his independent foraging habits thus far (he knows how to make white sauce! and coffee cakes! and ...beans and rice! ), so I don't think I'll make a habit of feeding him lunch. In terms of exercise, the most I got was walking around a lot and doing something like ten flights of stairsx20 on Wednesday, Thursday and Friday. While I liked this challenge, I did find that photographing my food and making sure that I had enough light was a fiddly part which easily added 5-10 minutes to each lunch. It's nice that I've got in the habit, though. Can't wait for week 5! I just noticed that I didn't post my goals for week 4, but they were pretty much the same as previous weeks. 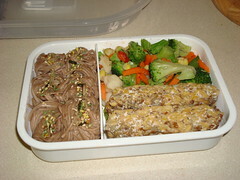 This week's bento lunches were all pretty yummy, and all of them worked pretty well in terms of nutrition. I really enjoyed learning about the Japanese celebration of the start of spring, Setsubun no hi, and I loved the ehou maki I made for that day. I've been wanting to make some sushi for a while now. I don't have a bamboo sushi rolling mat, but I was able to use a piece of parchment paper as a makeshift roller. I made sushi for another of this week's lunches, and it was also delicious. I think I'd postponed making sushi for a long while because here in Vermont it's hard to get fresh sushi-quality fish, but the pseudo-lobster I found was actually quite delicious. I'm looking forward to using the trout I will be catching in a couple of months in bento lunches, both cooked and also in sushi-like applications. Will report back! The Tibetan ratatouille was excellent, and kept well, so it figured in several meals this week. I'll be posting the recipe soon, I promise. My johbisai figured happily in several lunches --particularly those yummy mini and even more mini meatballs. They defrost quickly, and once I warm them up in the sauce (which takes barely a minute to whip up), they are good warm, and just as good at room temperature. I am pleased with my growing ability to create bento lunches with appropriate proportions of carbs, veggies, and protein. I think it's interesting how my mind thinks "I need this much rice to feel satisfied," and yet when I play my foodie edges I learn that a lesser amount of rice (or whichever carb I'm eating) is in fact completely satisfying. As a bonus, I find that lunches with more veggies and fewer starchy carbs end up making me feel more frisky, less sluggish. Yay frisky! I continue to love the role of this community in this challenge. I always find inspiration in the lunches that my fellow bento warriors post to the group pool, and often this translates to new foods getting added to my lunches. And I love the give & take of encouragement which this challenge has fostered. I think I probably take more time than most to do food prep & bento creation, and I'm amazed how those of you with families and jobs outside the house manage to keep making great bentos AND have a life. Bravo! I'm curious to see how I do with bento lunches once spring truly arrives here; I traditionally spend the winters holed up in my flat, but once the snow is gone, I'm outdoors from morning 'til night. What I hope is that I'll have gotten enough of a bento-making groove on that I'll have excellent lunches to take kayaking, fishing, etc. Thrifty & nutritious! As week 5 is about to commence, I'm already beginning to experience a bit of separation anxiety ;-) I hope some folks will continue to post lunches to the pool, discuss things on the forum, etc., after the challenge finishes. Onward! This week went way too fast, which was evident by my passing out this weekend and not doing anything. Overall the week went well I had enough variety, this week I had a lot of onigiri but that was fine, and my husband got a few bento this week and was fine with it. I walked two out of the three days, so that is better than nothing. Here is the week in summary, you can click on the pictures for more information, and the meat one is husband's. 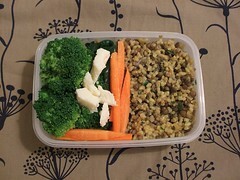 I was quite anxious about week 4 focus, ‘making bento for others’. I live with my two cats and usually have only myself to prepare lunch for, but a collegue of mine who is also a dear friend to me, has been following my bento improvements (well, let’s say my bento-making efforts!) with curiosity and support and she was happy when I asked her to ‘help’ me for the week focus and share the bento experience with me! She loves Japanese rice so much that choosing to make onigiri was quite natural to me. 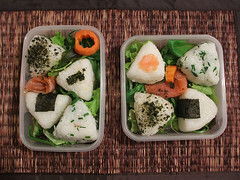 It was not a regular obento, though, made with leftovers and paying attention to food balance, but rather a ‘special-onigiri-lunch-with-friend’ so I think it stands apart…But then I had another opportunity to make bento for others, that was for my boyfriend on Friday. 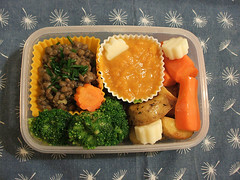 We had a bento-style lunch at home (real bento, this time) and He enjoyed it very much! :: extra efforts were made to prepare home-made afternoon snacks because althought the bento is very filling, I always end up eating something in the afternoon so I cooked some L size whole flour cookies with honey and no butter to have an healthy snack. I didn’t really do that well with bento making this week. I didn’t really do that well with cooking at all, actually. It was just one of those weeks! 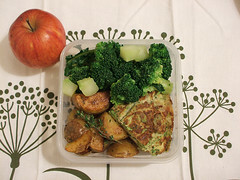 If you click through to flickr via those images, there are full descriptions of the bentos. I think I was just feeling uninspired. These are “leftovers” bentos with fresh fruits, veg. and nuts added. I don't make bentos for other people, so this week was about using leftovers and ingredients that I already have on hand. I made three bentos as I planned to do, and I did manage to do them without buying anything new. I packed some salad, lite Italian dressing, and made a flat out wrap with fake turkey slices and cheese. For dessert, I included pineapple. It was kind of a boring lunch, but it was my attempt at adapting a sandwich to bento format. Total calories: 412. Calorie-wise, I think my bentos have been fine, and I have managed to keep up the exercise. I am three pounds away from my goal. Once I get there, I will have lost 30 pounds. I might start a new goal of losing five or ten pounds after that, depending on how I feel about my progress. Congratulations! 30 lb is quite a feat. I didn't really follow the bento plan this week or last week because last week I had some minor surgery and slept most of last week and this week I'm still pretty tired. 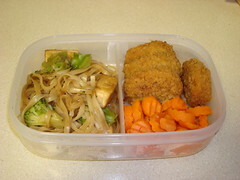 I did manage to make some bentos for my daughter in high school this week but forgot to take pics. I lost about 7 lbs. but I think that was mostly to missing some meals while I slept. Anyway! I'm feeling much better and will try to get back on plan for the rest of this week and hopefully will be back in the swing of things for week 6. Way to go everyone else! You all are doing so well! A bit late on the update, I know. But I lost my camera until now and wanted to post the only photo I managed to take, which was the tuesday bento (as far as I can remember). Mostly I only managed to make bento's for myself, but that one I managed to make on for dad too.